OS - El Loki stable. Hello! I have a problem when i use PHPStorm or something. For example i need to Push my commits to git. I press ctrl+shift+k and keyboard layout switch first, and CTRL+SHIFT+K not works. Is there any fix of this? Opt+Shift is the default shortcut for changing keyboard layouts in Loki, so you'll need to change that if you want to use the same modifier keys for other shortcuts. 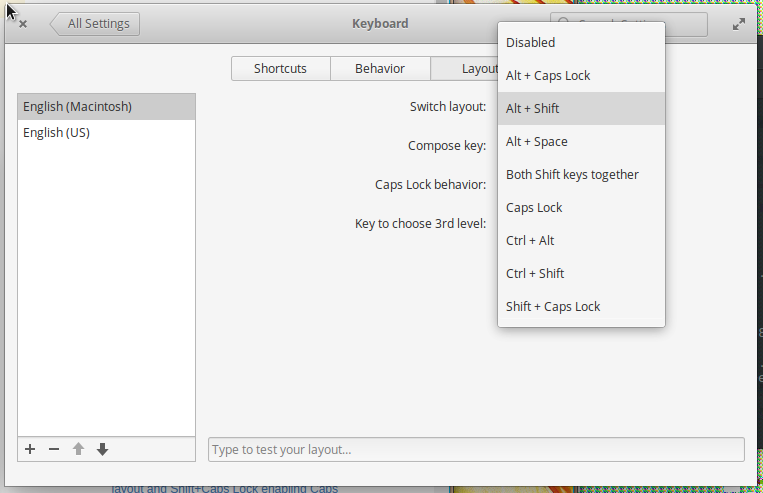 You can do this at Settings > Keyboard pane > Layout subtab > "Switch layout"
I my self switched from ubuntu and didn't know that this bug exists. but I have found that this bug is actually really old, you can spend some time to read it but in short, there are several patches proposed over the past years, and they are against the specification? So, I have no knowledge of Xorg patching, but I guess the patches that are proposed over there can solve it.